One Colorado animal shelter has a lot to celebrate this Christmas. All of the dogs at the Humane Society of the Pikes Peak Region, a nonprofit animal shelter in Colorado Springs, have been adopted thanks to the shelter's "Bring Them Home for the Holidays" campaign. The shelter waived pet adoption fees for those wanting to take home a furry friend before the holidays. A video of the staffers cheering the shelter's empty cages quickly went viral on Facebook with more than 150,000 views. "Although we've come close to adopting out all of our available dogs before, Monday was the first time we succeeded and had our dogs kennels completely empty!" Gretchen Pressley, the shelter's community relations manager told ABC News. "Seeing so many pets find wonderful new homes is what makes it all worthwhile for us." Pressley added that it's not too late to adopt a pet, as the shelter still has cats, and more dogs are available daily. It is waiving pet adoption fees until the New Year. According to the shelter, they adopted out 25 cats and 23 dogs as of Monday, but the kindhearted staff and volunteers won’t be stopping anytime soon. “We’ll have more dogs available later tonight or tomorrow. Keep those adoptions coming!”. 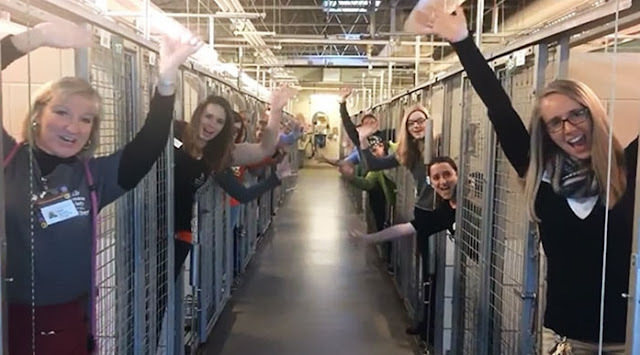 Responses to "Colorado Animal Shelter Celebrates When All Its Dogs Adopted in Time for Christmas"
Jeezua Camille Roth, what a debbie downer you are! I'm sure they still did checks on the families that were adopting, I don't think they would let just anybody take them if they couldn't provide properly. It's not like they just opened the kennels and let them all run loose and told everybody to just grab the one they wanted. Come on now..! No need to bash someone who is concerned. You can be happy and concerned at the same time. Jeez. Just because you're sitting at a keyboard doesn't mean you have to attack people since it's so easy. Let's look at the bigger picture here folks all these well deserving animals got a home for Christmas!! That's the best gift ever! This shelter had been doing a great job of adopting any other time I can't imagine they would just hand animals to anyone without the normal protocol. Great jobs guys keep up the amazing work!! This story lightens my heart. I'm so happy someone came up with an excellent slogan to help these lovely animals find forever homes! I applaud this shelter for their energy and their hard work. CONGRATULATIONS!